IN THE LEDGE – Who attended meeting with ‘Kinder Morgan strategy group’? Debate in the B.C. Legislature today (Feb. 19, 2018) between Kamloops-North Thompson MLA Peter Milobar, Environment Minister George Heyman, and Surrey-White Rock MLA Tracy Redies (Liberal) on attendance by Heyman at an environmental group event. P. Milobar: Last week the Minister of Environment confirmed he was at a private, two-day retreat of activists called the Kinder Morgan strategy group. In fact, he attended a dinner with that group on the same day as he triggered the trade war with Alberta. To the Minister of Environment: who attended this meeting? Hon. G. Heyman: I attended a dinner. I attended a question-and-answer period. I did not attend a strategy session. There was someone in the neighbourhood of 40 attendees, many of whom I did not know. I know some of them. I think the name of Tzeporah Berman has been identified, and I have spoken to that. There were many others, but I cannot give you a full list. Mr. Speaker: Kamloops–North Thompson on a supplemental. P. Milobar: That’s fairly troubling because, unlike the other groups the minister referenced last week, groups whose boards and CEOs are all publicly known, there is no publicly available information about the Kinder Morgan strategy group or the two-day retreat that the minister participated in, by way of that dinner. To the minister: why will he not tell us who attended? Is it because they have neglected to register as lobbyists? Hon. G. Heyman: As I’ve already said, I was not present for the entire two-day retreat. I was present for a dinner. I can name some of the people that I spoke to during that period of time: Tzeporah Berman, Karen Mahon, Sven Biggs, Tsouhalem Rivers, who is a newly elected councillor. I don’t want to give a list from memory because I may miss somebody, but I can also say that I do not know all of the people who were at the meeting. But we can certainly look at our records about who was there. I attended an invitation to answer questions. I do not believe it is — in fact, I know it is not — the responsibility of government to ensure that people we meet with are registered as lobbyists. It is the responsibility of lobbyists to ensure they’re registered as lobbyists. 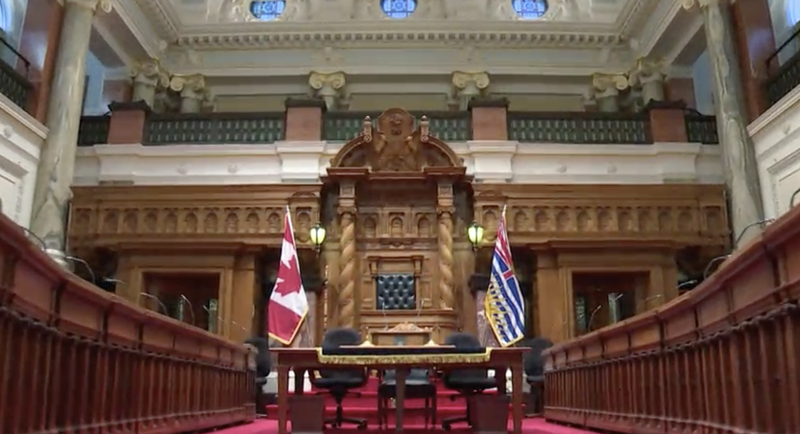 Mr. Speaker: Kamloops–North Thompson on a second supplemental. P. Milobar: I know the members opposite somewhere are finding this to be quite humorous, but this is quite serious. This was a dinner on the same night that the trade war with Alberta was triggered by statements made by the Minister of Environment. Now, I can appreciate that perhaps you don’t know every single person that was at that dinner, personally, and perhaps you may not even know the names if they’re registered as lobbyists or not. I’m assuming by your last answer, then, you won’t be making us go through an FOI so the public can have a very transparent view of who was there, but you will be tabling your calendar and any materials, as well, that were prepared for your presentation at that dinner. Hon. G. Heyman: I attended a dinner to answer the questions of legitimate people with interests in British Columbia, as I’ve attended dinners that many members of this House have attended from groups who come to Victoria. I’ve attended a luncheon hosted by the Business Council of British Columbia. I could not tell you the name of every person who was in the room, just the ones whom I happen to know personally and remember being there. Our calendars are published proactively. The reason that the member knows about this meeting was because it was in my calendar, which was published proactively. T. Redies: The day of the minister’s announcement Kinder Morgan shares dropped by over $800 million. Interestingly, one group that wasn’t surprised was the group the minister met with on Bowen Island. To the Minister of Finance. She must be aware of the serious implications of this. Will she investigate the actions of the Environment Minister? Hon. G. Heyman: I don’t want to make light of any of the serious issues that face people in this province. These are issues of the economy and the threat to our economy — to tens of thousands of jobs that depend on a healthy coastline, a healthy environment. Let me give the member opposite some examples. I take these examples from an announcement that was made in 2016, referring to 2014 figures, by a former Agriculture Minister and now the Member for Kelowna–Lake Country. We had 3,400 jobs in primary seafood sector in coastal communities and $981 million in seafood exports in 2014. If the question is: should I be faulted for keeping a promise to have dinner and answer questions with British Columbians…? I don’t think I should be faulted for that. I do my best to keep the commitments I’ve made to meet with all British Columbians, as I do my best to keep the commitments of our government to represent British Columbians’ interests, our jurisdiction, and to protect our economy and jobs for British Columbians. Mr. Speaker: The Member for Surrey–White Rock on a supplemental. T. Redies: On the eve of the budget, I’m very surprised that we have to spell this out for the other side of the House. For a government minister to work with a third party whose goal is to negatively impact the share price of a publicly-traded company — it’s completely inappropriate. These groups had press releases already drafted and ready to send out immediately after the Environment Minister’s announcement. So, back to the finance minister. Will she get to the bottom of exactly what information the Environment Minister shared with his Bowen Island buddies? Hon. G. Heyman: If my buddies are to be judged by those people with whom I meet, then I’m proud to count B.C. Business Council president, Greg D’Avignon; vice president of Canadian Association of Petroleum Producers, Brad Herald; president of the Mining Association of B.C., Bryan Cox; as well as members of the Canadian Energy Pipeline Association, with whom I’ll meet next week; and members of the B.C. Chamber of Commerce. House and answer for the measures that we’re taking to assert every bit of legitimate jurisdiction that our province has to protect our environment and our economy and the thousands of jobs that depend on a clean, healthy coastline. That’s what British Columbians expect of me and our government. That’s not what they got from the previous government. We’re talking action to correct that. 3 Comments on IN THE LEDGE – Who attended meeting with ‘Kinder Morgan strategy group’? How about who paid for the Minister to attend this “two day event / retreat” or whatever it was? I would wonder it this is in the public interest and meets all aspects of staying “neutral” which clearly the NDP Government is not. I am interested in whether any funds from the US were used to fund the dinner. I also wonder why neither NDP or GP refuse to listen to science that disagrees with their beliefs. I may have just answered my own question they are true believers in a noble cause so real knowledge can’t interfere with saving the world. Once again, Milobar, and his Liberal sidekicks are on their horses, lances in hand, tilting at windmills that don’t exist except in their own minds .